I know it’s been a few weeks, but I hope you still remember me and this little thing called a blog that I’m trying to get off the ground. I have to say I have gained a new admiration for all of my fellow food bloggers out there. Finding time to cook, be organized enough to write about and photograph what I cook, and then get it all on to a computer while fulfilling my social obligations, full time job, and staying in shape (both physically and mentally…Tell me how you all do it! Pretty please? For now, I am convinced that the more I force myself to [in the words of Nike] “Just do it” the easier it will become. True? I hope? Anyhow, one of my favorite things about my blog is being able to share my recipes with all of my friends and family. It’s a way for me to pass along what I’ve learned in the culinary world to everyone I love (that includes you, virtual friends!) with one easy URL. I liked a little bit of sweetness, but have never been able to get past marshmallows on anything except hot chocolate and s’mores. Boom, maple syrup. I knew this would add a great, homey sweetness yet not be overwhelmingly cloying. Next, I knew there needed to be an element of crunch. 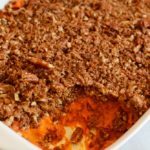 Pecans are a classic, and I love ‘em, but I wanted something more. I saw a recipe that used Rice Krispies in the topping, which intrigued me. Since I already had some Multigrain Spoonfuls in my pantry (and hey! They’re multigrain! Score one point for the healthy folk!) I decided to use those instead. I figured the nuttiness of the multigrain cereal would pair perfectly with the toasted pecans. Now I had the sweet and the crunch, and to add just one more element of mouth tickling surprise, I wanted to add some nice and subtle heat. Hello, cayenne! 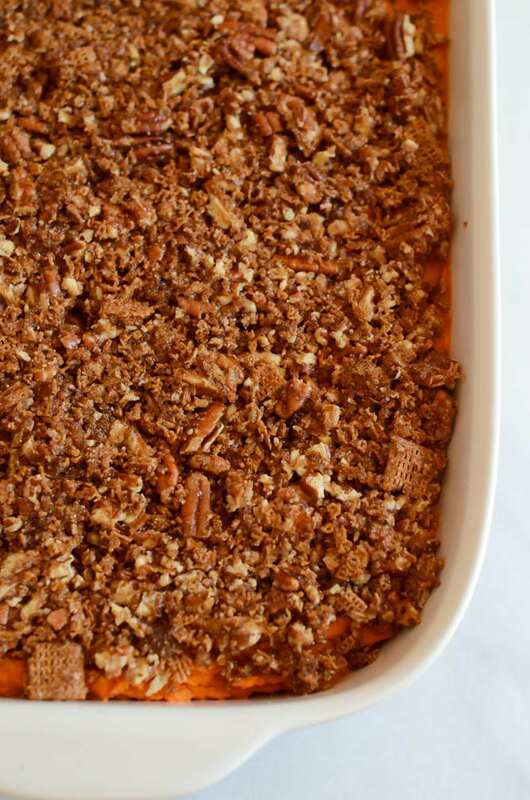 One of the best things about this casserole recipe is that it’s TOTALLY adaptable. Not a fan of spice? Leave out the cayenne. Want more sweet to balance out the spice? Add more maple syrup. The possibilities are endless, folks. My favorite kind of recipe. Yams are rinsed and diced. We like to leave the skin on to really give the dish that “rustic” taste and look. Same reason we want to roast our yams instead of steaming/boiling them. We love that roasty, toasty flavor, don’t we? Glad we can all agree on that. Salt and pepper can never be forgotten. 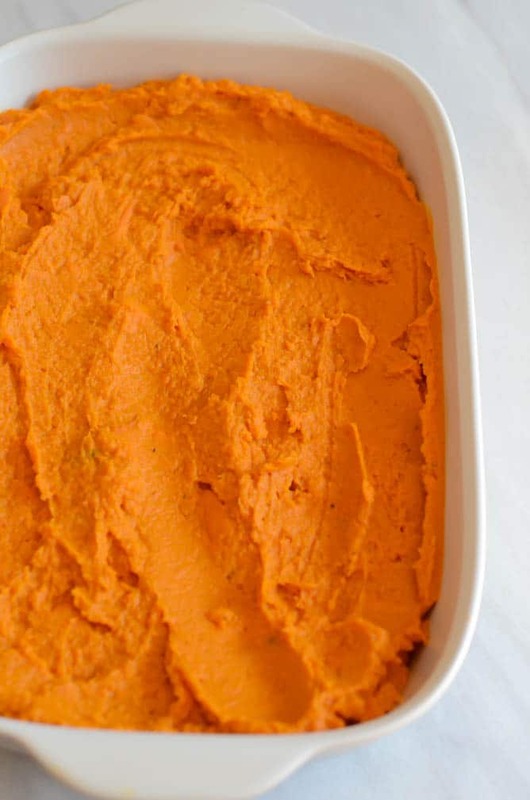 Now that are yams are nice and soft and ROASTED, we throw them into our trusty food processor. Get the cayenne, butter and maple syrup up in there as well. We want these things to all be the best of friends. But wait! Stop food processing before all the yams are silky smooth. We want to leave a few chunks in there for good measure. This adds to the “rustic” theme we’re going for, right? Next all of this chunky smooth deliciousness goes into our baking vessel. Spread it nice and evenly in there. 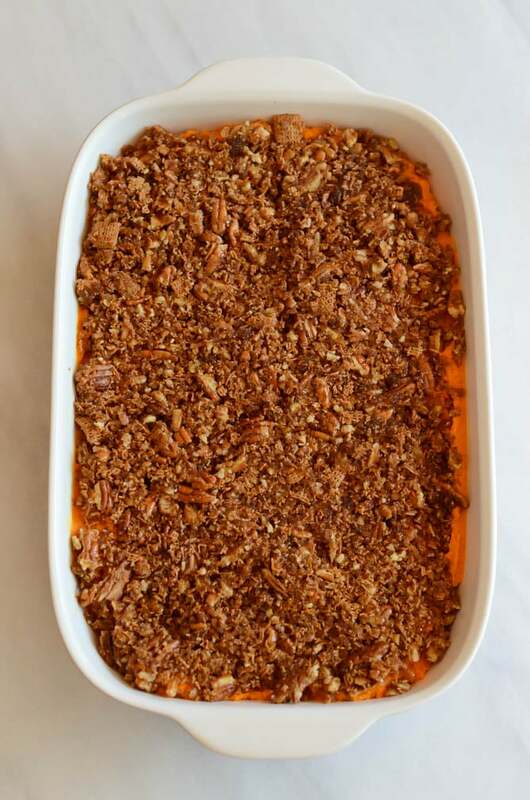 Now’s the time to get our crumble on. Mix up the pecan-cereal-brown sugar-butter deliciousness and sprinkle it on. Work it. Into the oven we go. 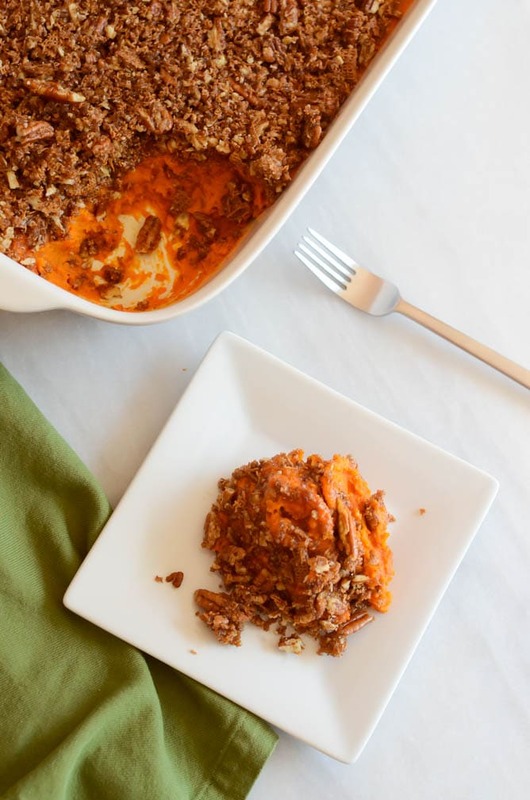 And 20 minutes later you won’t even want to think about any other component of your Thanksgiving dinner but this casserole. Serve it up nice and warm. I won’t even tell if it doesn’t make it on to a plate. Spoon –> Mouth –> Yum and done. Place diced yams on rimmed baking sheet lined with aluminum foil. I had to divide my yams into two batches to fit on the baking sheet. Drizzle two tablespoons melted coconut oil over first batch of yams, season with salt and pepper. Roast in oven for 20 minutes, or until yams feel soft when poked with a fork. Remove first batch of yams from oven and repeat entire process with second batch of yams. 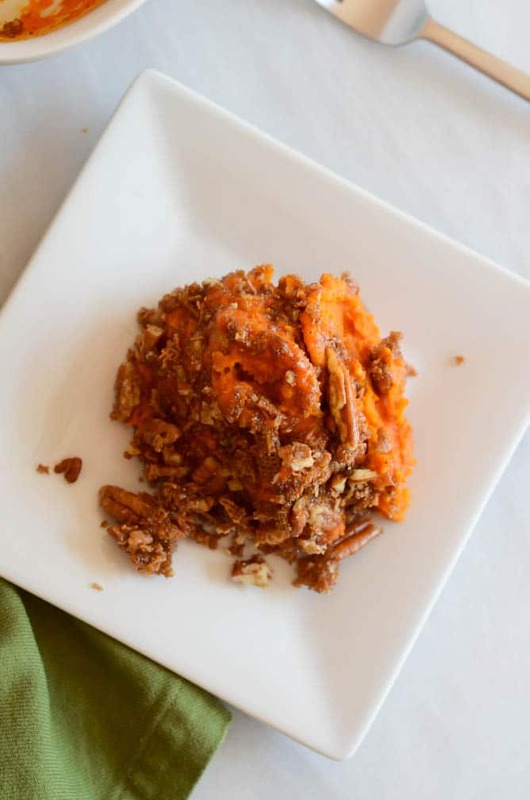 Once yams are done roasting, add to food processor (you can also use a high powered blender or a hand mixer.) Add cayenne, 5 tablespoons of melted butter and maple syrup. Turn on food processor and puree/pulse until smooth but with a few chunks still remaining. Pour yams into baking dish [I use a cast iron baking dish that’s approximately 11 inches x 5 inches, with some good depth to it. 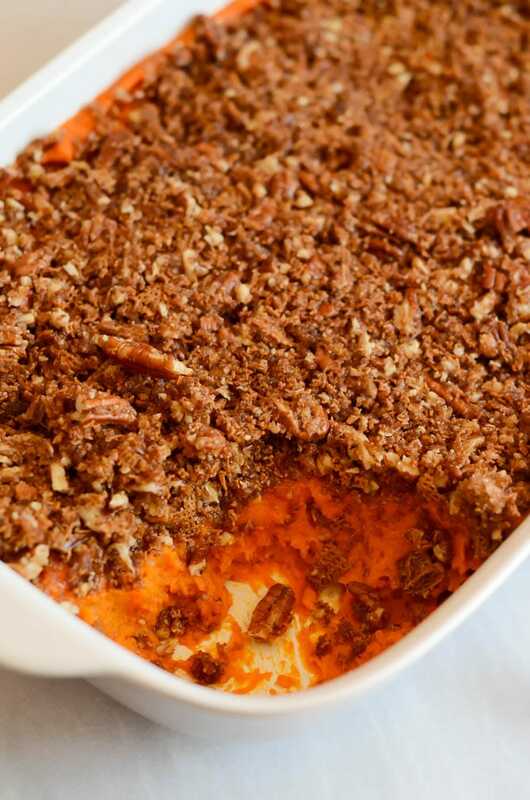 You can really use any dish that will fit the yams and give you good service area for the topping.] Spread evenly, set aside. Place pecans on baking sheet in 350 degree oven for 5 minutes to toast. Remove from oven and let cool slightly. Combine cereal and pecans in a Ziploc bag and use a mallet to pound into small, even pieces. Pour into small mixing bowl and add 6 tablespoons melted butter and brown sugar. Stir to combine. Sprinkle but and cereal topping over yams. Bake in 350 degree oven for 20 minutes. Remove, let cool slightly, and enjoy! Author’s Note: In the interest of time and Turkey Day fast approaching, I wanted to get this recipe out to y’all. BUT, when I make it again for my parents on Thanksgiving, I am totally planning on adding some crispy pancetta to the mix to up the sweet-salty-spicy trifecta. I’ll let you know how my experiment goes and please fill me in on any other fun variations you do with this recipe! This post contains affiliate links. As always, all thoughts and opinions are my own. Thank you for your continued support of CaliGirl Cooking!